The other big announcement for the day is of course Apple’s new iPads, the iPad Air 2 and the iPad mini 3. As signaled by their names, neither is intended to be a massive departure from their (still for sale) predecessors. But both of them, the iPad Air 2 in particular, pack a number of improvements over the 2013 models. 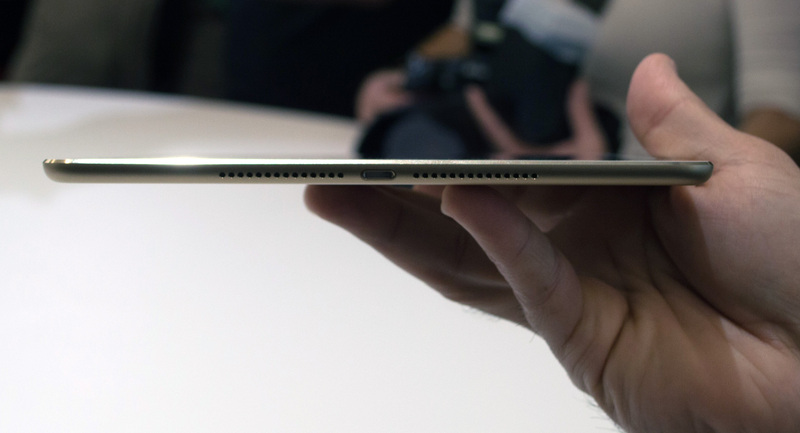 In-hand, the iPad Air 2 is not as significant a departure from its predecessor as the original Air was from earlier iPads, but if you are familiar with the original Air then you can appreciate the fact that Apple has taken it down from 7.5mm thick to 6.1mm thick. The weight is roughly the same (437g vs. 469g) so it’s not much lighter in the hand, but handling it makes the change in size more apparent. Perhaps more readily apparent is the anti-reflective coating, a first for an iPad. While Apple’s controlled demo room doesn’t give us the opportunity to introduce too much light, in what testing we could do there’s definitely a difference. Whatever it is that Apple is using, the coating doesn’t seem to have changed the clarity at all; it is seemingly still as clear as the non-coated iPad mini 3. Meanwhile the A8X inside presents us with a new mystery. This is a new chip, and we know very little about it besides Apple’s claims of 40% better CPU performance and 2.5x better GPU performance. The CPU performance points to a dual core “Enhanced Cyclone” configuration like A8, while the GPU performance number is well in excess of what we saw going from A7 to A8. So comparing A8X to A7, we are most likely (finally) looking at a hex-core Imagination PowerVR GX6650 GPU. However, this alone does not explain where the roughly 1 billion additional transistors compared to A8 have gone. Most likely there are additional surprises to be found. Moving on, we have the iPad mini 3. 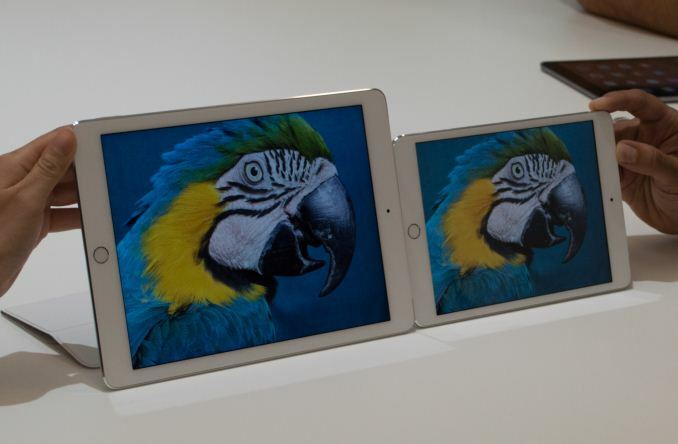 Unlike the iPad Air 2, Apple isn’t overhauling the hardware by nearly as much, so the iPad mini 3 is a smaller upgrade over its predecessor than the iPad Air 2 is. Size and weight stay the same, so the new mini feels the same in your hands as the old one. The display is also once more a 2048 x 1536 pixel display, though it did look a bit better than we recall the iPad mini 2’s display being, so it may be a new panel (but this is something we’d need to test). Apple hasn’t replaced the SoC or WiFi radio – it’s still an A7 and 802.11n respectively – so performance isn’t any different either. What’s left to set apart the new mini from the old then is the inclusion of Apple’s Touch ID sensor along with a larger 128GB storage option. 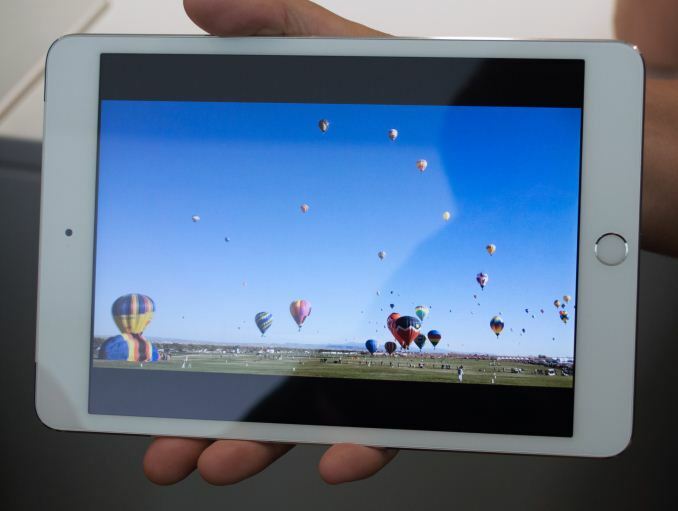 It’s admittedly not much, especially when the iPad mini 2 is now $100 cheaper. On the other hand it is available in Gold, and as we’ve seen with the iPhone that has proven to be a very popular option at launch. Actually, if you compare the price of the iPad 3 to the iPad 2 when it was released last year its $100 cheaper for the 64GB and 128GB models. If you didn't upgrade when the iPad mini 2 came out then getting an iPad mini 3 should be a given if you want anything more than 16GB. Yeah, that's really an odd "new" product. You can get a faster SoC in their iPhone 6/6 Plus, and faster still in the iPad Air 2. If you're a fan of the mini and already own the mini 2, I think you wait for the inevitable mini 4 with A8/A8X. And if you don't own a mini 2 and were waiting for the mini 3, I think $100 more for Touch ID is too much. Huh, this made no sense to me (though Apple often doesn't) but that explanation makes sense. I'm tempted by the Air 2, but I'm swearing off Apple until they replace that Lightning connector. I've had FOUR devices die, unable to sync or charge, and the last (an iPhone 5s which lasted 10 months) I absolutely babied, doing almost nothing with it but carefully setting it in its cradle at home, s ticking it in a sealed compartment in my bag, and sticking it in a cradle at work. I'd avoid taking it with me places whenever possible. Lasted longer than any other lightning connector device I've used, but still, 10 months? 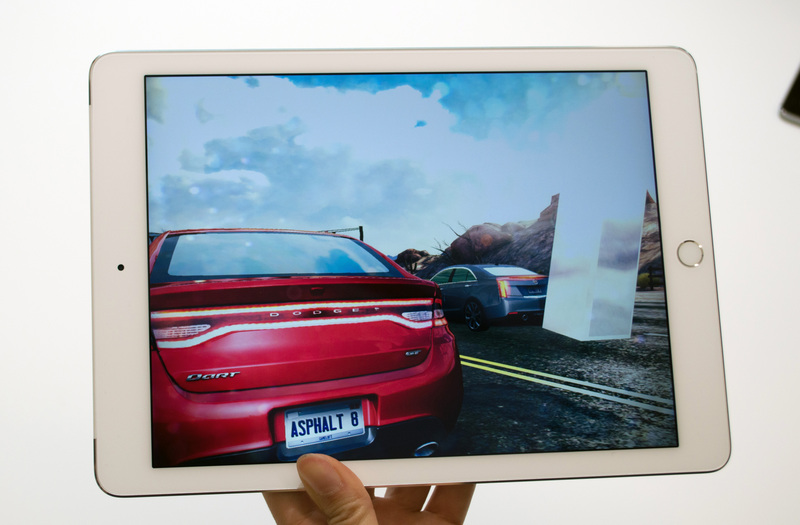 Yeah, one of the notable things about the last mini was that it had the same processor generation as the iPad Air. In this case, I'd have expected the A8 from the iPhone. Actually, it's exactly the same as the previous mini, only with Touch ID. I have the previous mini with 128GB. But the old mini is only available in 16 and 32GB configs now. And the 64 and 128GB of the mini 3 are now $100 cheaper than the retina mini (now mini 2) configs were before the update.